"I have a lot of impossible dreams"
On Sunday, Inocente won the Oscar for best documentary short. 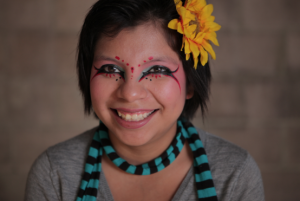 This film follows the inspirational story of Inocente (above) who uses her art to create a positive space in her life, constrained by being homeless and being undocumented. The film site has a synopsis and links of ways to get involved in arts education (constantly threatened by budget cuts in a standardized test-driven educational world), homelessness (on the rise, especially for children, with gentrification and other social exclusion), and undocumented children (nearly 2 million children have been brought here). Fact sheets for each one are available on the left. For Sociology profs, think about how you could illustrate intersectionality! For a limited time, you can watch the documentary free on mtv (click on full episode below). It's an incredible short, very intimate, colorful, inspirational. It shows the human underneath the categorization we use, behind the exclusion. Enjoy!